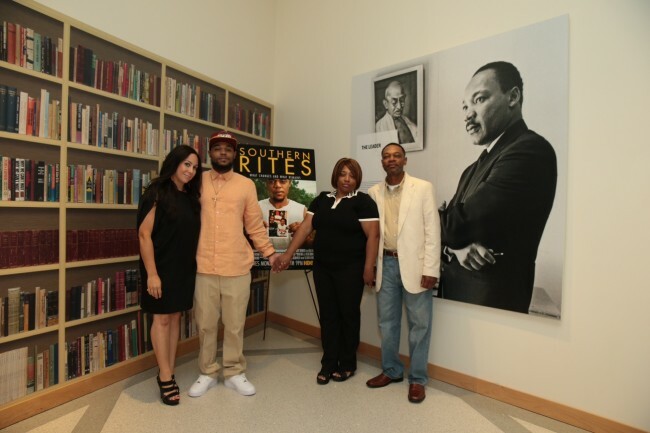 ‘Southern Rites’ director Gillian Laub with the family of Justin Patterson at the National Center for Civil and Human Rights (Photos by Kelly Kline). Southern Rites is the poignant, tear-jerking HBO feature documentary directed by Gillian Laub that chronicles racial segregation still prevalent throughout certain parts of south and middle Georgia. Laub’s directorial debut dates back to 2002 when the award-winning photographer was commissioned to take pictures of Montgomery County’s high school students still attending segregated proms and homecoming events. Laub’s images accompanied a controversial feature story that landed in the New York Times Magazine in 2009. The photojournalist who studied at the International Center for Photography figured out that her style of portraiture could spark conversations that could hopefully create change. Once Laub began to take recurring trips to Mt. Vernon, Ga. a year later to follow up on the aftermath of the integrated prom, she was hit with both tragedy and hope just miles apart. Justin Patterson, a 22-year-old black male, was shot and killed by Norman Neesmith, a 60-something white male, in the neighboring Toombs County. It still disappoints Laub that Patterson’s death received no local or national coverage. A great deal of Southern Rites’ jaw-dropping screen time offers details of the incident and follows the court proceedings to prosecute Neesmith. Laub sat directly beside Patterson’s family when the film premiered in Atlanta. Like Patterson’s relatives, the first-time-filmmaker sobbed during different scenes. Southern Rites also followed the election campaign for Calvin Burns, a 24-year-veteran of law enforcement, to become the first black sheriff. The support from Burns’ family and various members of the community provided a visual antithesis for the boiling race matters present in the town and film. As Laub was searching for partners to help support Southern Rites, a close friend of hers showed a “sizzle reel” to Grammy-and-Oscar-winning performer John Legend and Lady Gaga’s former manager-turned-entrepreneur Troy Carter. Both were impressed by Laub’s trailer, so they became two of the film’s executive producers. Grammy-winning producer Alex Da Kid also signed on as an executive producer. Southern Rites is the first project produced by Legend’s production company, Get Lifted Films, and Carter’s company, Atom Factory. Filmmaking was a challenge for Laub. Originally studying comparative literature at University of Wisconsin – Madison, Laub thinks Southern Rites is a low budget movie. She then speaks about making the transition from still photography to moving pictures. “I learned from a lot of mistakes really,” she says resting comfortably on her right leg. “Still photography is a different muscle you’re using. You’re trying to tell a story in one image. In film, you’re dealing with so many more elements. It was an overwhelming amount of technical stuff to learn.” Laub’s time and dedication in middle and south Georgia was time well spent. Southern Rites has morphed from a film project into both a photography book and feature exhibit at New York’s Benrubi Gallery. She is proud of the final product(s) and having HBO support it. Laub actually struggled with the title Southern Rites during production. People interrogated Laub about why she decided to go back-and-forth to make Southern Rites. She credits the town’s young people for motivating her. Laub’s face illuminated anytime one of them called her multiple times on her iPhone en route to the Atlanta premiere. Southern Rites, in essence, is a story that reflects race in contemporary America. Laub hopes viewers, regardless of differences, will come away from the film asking questions about what they can do to make society better. Southern Rites premiered on Mon., May 18 at 9:00 p.m. ET on HBO. Check local listings for air times. The exhibit at Benrubi Gallery runs from May 14 – June 27, 2015. This post was written by Christopher A. Daniel, pop cultural critic and music editor for the Burton Wire. He is also contributing writer for Urban Lux Magazine and Blues & Soul Magazine. Follow Christopher @Journalistorian on Twitter.